Lian-Kuan Chen received the B.S. degree in electrical engineering from National Taiwan University in 1983 and the M.S. and Ph.D. degree in electrical engineering from Columbia University, New York, in 1992. He joined the faculty of Department of Information Engineering, the Chinese University of Hong Kong and established the Lightwave Communications Laboratory in1992. He was the Department Chairman in 2004-2006. In 2007-2013, he was a member of the engineering panel of Hong Kong Government Research Grant Council. He served as the director for the Centre for Advanced Research in Photonics in 2010-2015. His research includes visible light communication, optical wireless communication, next-generation local access networks, transmission systems, optical/electronic signal processing, performance monitoring, and bio-photonics. 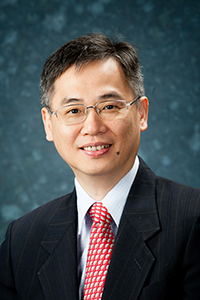 Professor Chen has published more than 270 papers in referred international conferences and journals. He is a senior member of IEEE Photonics Society and Communications Society, and a member of OSA. He has served as an associate editor of IEEE Photonics Technology Letters (2005-2011) and OSA/IEEE Journal of Optical Communications and Networking (2012-2015). For his name's sake (in Chinese), he believes he will continue to engage in research related to Light in the foreseeable future. Y. Fu, Y. Hong, L.K. Chen, C.W. Sung, "Enhanced Power Allocation for Sum Rate Maximization in OFDM-NOMA VLC Systems," IEEE Photonics Technology Letters, vol. 30, no. 13, pp. 1218 - 1221, Jul. 2018. H. M. Lu, Y. Hong, L.K. Chen, J. P. Wang, "On the study of the relation between linear/nonlinear PAPR reduction and transmission performance for OFDM-based VLC systems," Optics Express, vol. 26, no. 11, pp. 13891 - 13901, May. 2018. Y. Hong, S. Gao, L.K. Chen, J. Zhao, "SNR-threshold based Adaptive Loading for PAM-Fast-OFDM over Optical Wireless Communications," IEEE/OSA Optical Fiber Communication Conference (OFC), Paper M2K.4, San Diego, California, USA, Mar. 2018. Y. Shao, Y. Hong, L.K. Chen, "On CSI-free Linear Equalization for Optical Fast-OFDM over Visible Light Communications," IEEE/OSA Optical Fiber Communication Conference (OFC), Paper M3K.5, San Diego, California, USA, Mar. 2018. X. Wu, Y. Hong, Y. Tong, L. Chang, W. Zhou, L.K. Chen, "Monolithic Dual-polarization Silicon Modulator for 180 Gb/s DMT Signal Transmission," IEEE/OSA Optical Fiber Communication Conference (OFC), Paper W4D.3, San Diego, California, USA, Mar. 2018. J. Shi, Y. Hong, J. He, R. Deng, L.K. Chen, "Experimental Demonstration of OQAM-OFDM based MIMO-NOMA over Visible Light Communications," IEEE/OSA Optical Fiber Communication Conference (OFC), Paper M2K.3, San Diego, California, USA, Mar. 2018. L.K. Chen, Y. Hong, "Channel-independent Signal Processing for High-speed VLC Systems," OECC 2017, Paper 3-3L-3 (Invited Paper), Singapore, Aug. 2017. Y. Hong, L.K. Chen, "Multi-band Orthogonal Circulant Matrix Transform Precoding over Visible Light Communications," OECC and PGC 2017, Paper 3-1L-3, Singapore, Aug. 2017. Y. Hong, J. Xu, L.K. Chen, "Experimental investigation of multi-band OCT precoding for OFDM-based visible light communications," Optics Express, vol. 25, no. 11, pp. 12908 - 12914, May. 2017. J. Zhao, L.K. Chen, "Adaptively loaded IM/DD optical OFDM based on set-partitioned QAM formats," Optics Express, vol. 25, no. 8, pp. 9368 - 9377, Apr. 2017. J. Zhao, L.K. Chen, "First Investigation of IM/DD OFDM using Set-Partition Formats for Fiber Communications," IEEE Conference on Lasers and Electro-Optics (CLEO), Paper STh1O.4, San Jose, California, USA, May. 2017. Y. Hong, L.K. Chen, X. Guan, "Adaptive Physical-layer Network Coding over Visible Light Communications," IEEE/OSA Optical Fiber Communication Conference (OFC), Paper Th1E.4, Los Angeles, California, USA, Mar. 2017. Y. Hong, L.K. Chen, J. Zhao, "Experimental Demonstration of Performance-enhanced MIMO-OFDM Visible Light Communications," IEEE/OSA Optical Fiber Communication Conference (OFC), Paper Th1E.2, Los Angeles, California, USA, Mar. 2017. T. Wu, L.K. Chen, Y. Hong, "A vision-based indoor positioning method with high accuracy and efficiency based on self-optimized-ordered visual vocabulary," IEEE/ION Position, Location and Navigation Symposium (PLANS), Savannah, United States, Jan. 2016. Y. Hong, L.K. Chen, "Toward user mobility for OFDM-based visible light communications," OSA Optics Letters, vol. 41, no. 16, pp. 3763 - 3766, Aug. 2016. Y. Hong, L.K. Chen, "OCT Precoding for OFDM-based Indoor Visible Light Communications," Opto-Electronics Communication Conference/International Conference on Photonics in Switching (OECC/PS), Paper TuD3-3, Niigata, Japan, Jul. 2016. Y. Hong, X. Guan, L.K. Chen, J. Zhao, "Experimental Demonstration of an OCT-based Precoding Scheme for Visible Light Communications," IEEE/OSA Optical Fiber Communication Conference (OFC), Paper M3A.6, Anaheim, California, USA, Mar. 2016. Y. Hong, T. Wu, L.K. Chen, "On the Performance of Adaptive MIMO-OFDM Indoor Visible Light Communications," IEEE Photonics Technology Letters, vol. 28, no. 8, pp. 907-910, Apr. 2016. “High-speed Solar-Panel/Image-Sensor based VLC for Smart Cities: Design Challenges and Advanced Signal Processing” RGC GRF 2018. “Spectrally-efficient Multiple Access for Multi-user Visible Light Communications” RGC GRF 2017. “High-speed Mobile Visible Light Communications and Networking for Eco-friendly Underwater and Intelligent Transportation Applications” RGC GRF 2016. “Advanced Modulation Formats using Directly Modulated Lasers and Full-Field Detection Receivers” RGC GRF 2015. “Orthogonal Frequency Division Multiplexing Based Coherent Burst-Mode Receivers” RGC GRF 2014.